At midnight on Halloween in a cloistered New England suburb, a car carrying five teenagers leaves a winding road and slams into a tree, killing three of them. One escapes unharmed, another suffers severe brain damage. A year later, summoned by the memories of those closest to them, the three who died come back on a last chilling mission among the living. A strange and unsettling ghost story in the tradition of Ray Bradbury and Shirley Jackson, The Night Country creeps through the leaf-strewn streets and quiet cul-de-sacs of one bedroom community, reaching into the desperately connected yet isolated lives of three people changed forever by the accident: Tim, who survived yet lost everything; Brooks, the cop whose guilty secret has destroyed his life; and Kyle's mom, trying to love the new son the doctors returned to her. As the day wanes and darkness falls, one of them puts a terrible plan into effect, and they find themselves caught in a collision of need and desire, watched over by the knowing ghosts. 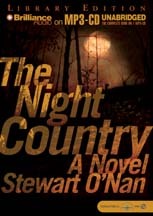 Macabre and moving, The Night Country elevates every small town's bad high school crash into myth, finding the deeper human truth beneath a shared and very American tragedy. At first I couldn't get in to this book for the first thirty minutes, but I was tired so the next day I started over again. It grew on me. It's a pretty good book telling it from the dead person's point of view. It does have that Ray Bradbury style. The narrator was good too. Have to pay close attention to understand what's going on. All in all a good book! amazing narration. keeps you wondering what is next.